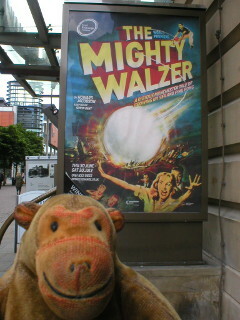 Mr Monkey caught a bus into Manchester and scampered along to the Royal Exchange Theatre for the press night of The Mighty Walzer. The Mighty Walzer is Howard Jacobson's sixth novel, which won the Bollinger Everyman Wodehouse Prize for comic writing. The partly autobiographical book has been adapted for the stage by Simon Bent. The Mighty Walzer tells the story of Oliver Walzer, an under-achieving and rather introverted Jewish boy living in Manchester in the mid to late 1950s. He is torn between his father who wants him to think big and his mother who wants him to avoid standing out and to accept failure before trying anything. Afflicted by puberty, he spends most of his time in the family bathroom, until he finds a high quality table tennis ball floating in the lake at Heaton Park (onstage it descended in a blaze of light to the sound of a heavenly choir), takes it home and, with the aid of a copy of Dr Jekyll and Mr Hyde (there was no racket in the lake), becomes an obsessive solo table tennis player. Eventually his father forces him to visit an actual table tennis club, where it turns out that he can actually play table tennis against a real person better than he'd expected. 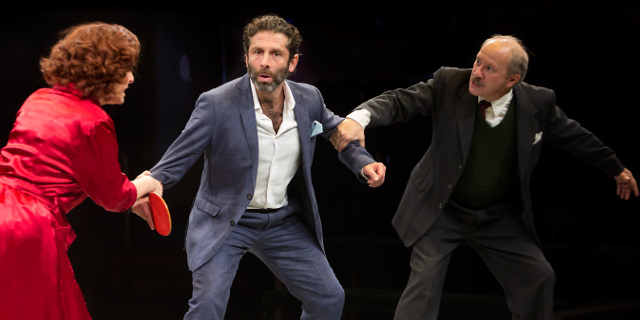 This leads to an almost glorious career in playing table tennis and, more importantly to Oliver meeting a disgraced table tennis champion who brings disaster upon his aunts, a Jewish teddy boy who becomes the son his father really wanted, and, possibly most importantly, a girl. All of this is described by an adult Oliver, looking back on his adolescence from middle age. The set for The Mighty Walzer is a simple empty stage, covered with mildly unpleasant 1950s coloured linoleum. Bits of scenery are brought on as needed; the largest is Mr Walzer's battered Bedford van loaded with cheap goods of doubtful quality and usefulness. Helpfully, the van is left outside the pod during the interval to allow everyone to inspect the goods. The first act of the play is extremely funny, with few lines foreshadowing later calamities. After the interval the life of the Walzer family falls apart, though the adult Oliver, with the benefit of hindsight, makes it all sound more amusing than it would be in real life. 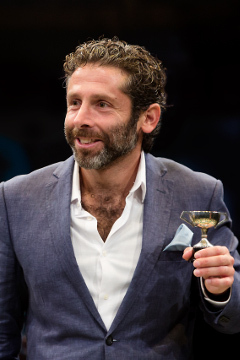 As Oliver Walzer, Eliot Levey is onstage virtually the entire time - it is his story, after all - and Mr Monkey thought he was excellent. While he's playing a rather shy character he fairly dominated the stage, even when just idling around the edge. The rest of the cast are also excellent, especially Tracy-Ann Oberman as Oliver's mother, always ready to sympathise with failure and ignore success, and Joe Coen as the flamboyant Sheeny Waxman, always trying to change Oliver's memories to improve the story. Mr Monkey really enjoyed The Mighty Walzer and thoroughly recommends it as a funny bitter-sweet drama about growing up before teenagers were really recognized as teenagers. He's still not sure about the mysterious attraction of table tennis, though. The Mighty Walzer runs until 30th July 2016.